An old-time recipe Delicious, homey and filling. I like to try to do my part in preserving old recipes and old ways of doing things. It makes me feel closer to those who I love who have passed away. Here’s a recipe that really made me remember when I was a child. That’s a little odd because when it was being described to me I would have sworn I had never eaten it. The taste was what brought the flood of memories back. I got this recipe over a conversation with a very unlikely source – a friend of mine from “home” who is known more for his love of meat and potatoes than anything else. Well, maybe one other thing (his love of beer…). Regardless, the recipe that I was told (over a drink or two, of course) was from his childhood. His family was connected to the fishery, so I imagine fish was probably on the menu a lot. Maybe not salted fish, but fish. Perhaps that’s why he has an aversion to anything that’s not simple meat and potatoes now. 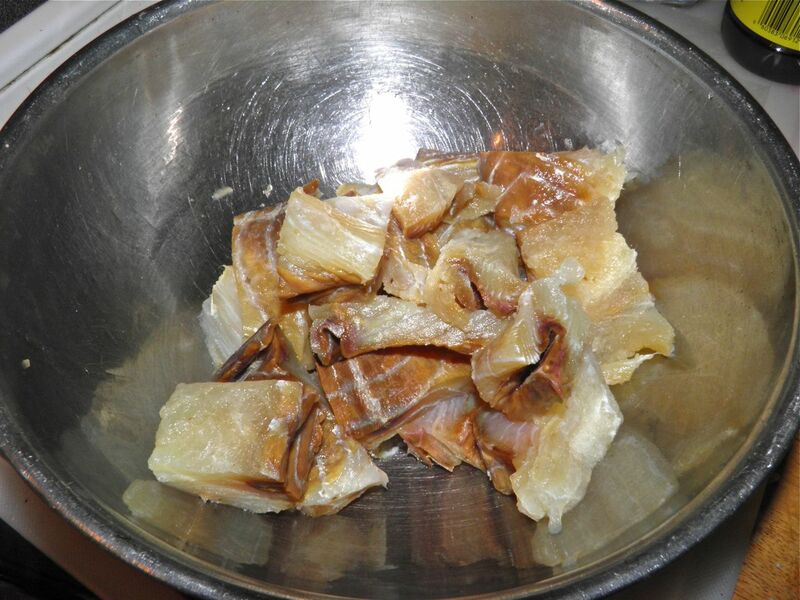 You must soak salted fish before using for several hours. It rehydrates the fish and removes much of the salt. Salt has an interesting history. It was one of the most valued seasonings in most cultures for millenia. For example, the phrase "not worth his salt" dates from a time in the ancient world when slaves were traded for that precious commodity. For some more very interesting info on salt and history look HERE. Drying and/or salting food are two of the world's oldest known preservation methods. Preserved fish can be stored for several years. In 3,000 BCE Egyptians were exporting salt fish to the Phoenicians in return for expensive luxuries. Salting became far more common during the 16th century when salt became available in quantity throughout northern Europe. Salting fish was therefore cheap – and the work could be done easily by anyone with little to no special skills. At the time of the European discovery of the Grand Banks off Newfoundland, salted fish (cod in particular) became an important item of commerce between the New and Old Worlds. It quickly became a central ingredient not only in European cuisine, but also in the Mediterranean, West African, Caribbean, and Brazil. After soaking – ready for the pot. The following information is abridged from a Nova Scotia salted pollock producer. Salted pollock contains just 60 calories in a 2 oz. serving. For dieters, this is just 3% of a 2,000-calorie-per-day diet. It is even lower than many other types of fish, including salmon, which comes in at 117 calories for the same weight. It is also high in protein. one serving containing 14 g of protein, which is more than twice the amount of one egg. Salted pollock also contains no fat or carbohydrates. It is relatively high in cholesterol (at 30 mg), and isn't particularly high in vitamins and minerals but does contain a few. This recipe is simplicity itself, as most homestyle recipes are. My friend is no friend of complex recipes, to be sure. But that’s what you want in home-style comfort food. What really intrigued me was the method of soaking the onions in malt vinegar. No cooking – just soaking. That was an unexpected "exotic" twist. This recipe must have come from his mother and as such is a memory of his childhood. We used to have delicious smoked haddock when I was growing up and occasionally salted fish. That I remember. Maybe I didn’t remember this recipe because I didn’t like it at the time. We probably had cod, which isn’t a favourite of mine anyway. Thank goodness my palate has “matured.” This is one of those comfort meals that will make memories of your own – guaranteed. 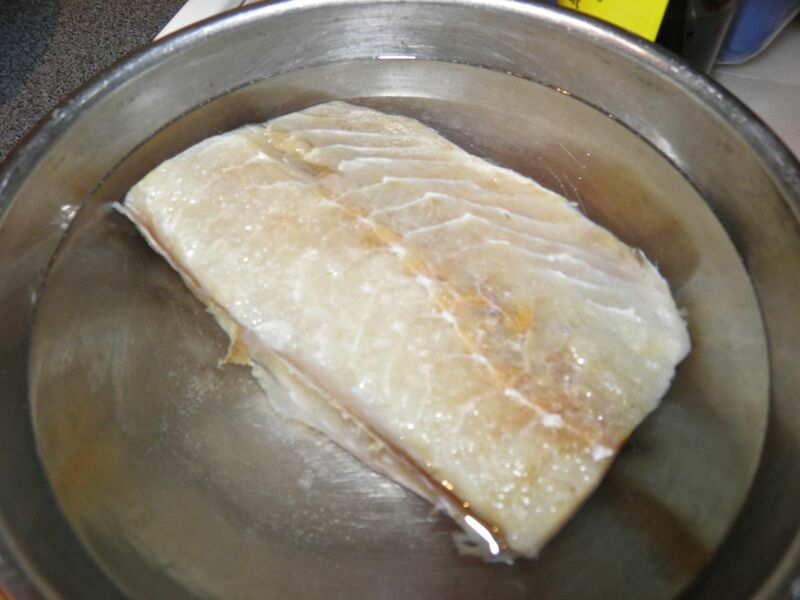 In the morning, soak the pollock for 8 hours (while you're at work) in cold water to extract much of the salt and rehydrate the fish. Change the water when you get home and let soak for a further 1/2 hour. Drain and cut in chunks. Slice the onions and toss with the vinegar and sugar. Let sit for 1/2 hour while you finish the meal. Peel and cut the potatoes into fairly large pieces. Boil the potatoes in water – you need no salt – for 10 minutes. Add the fish and boil for a further 8 minutes. Drain the water from the fish and potatoes. Add the butter, cream and pepper and stir to combine. 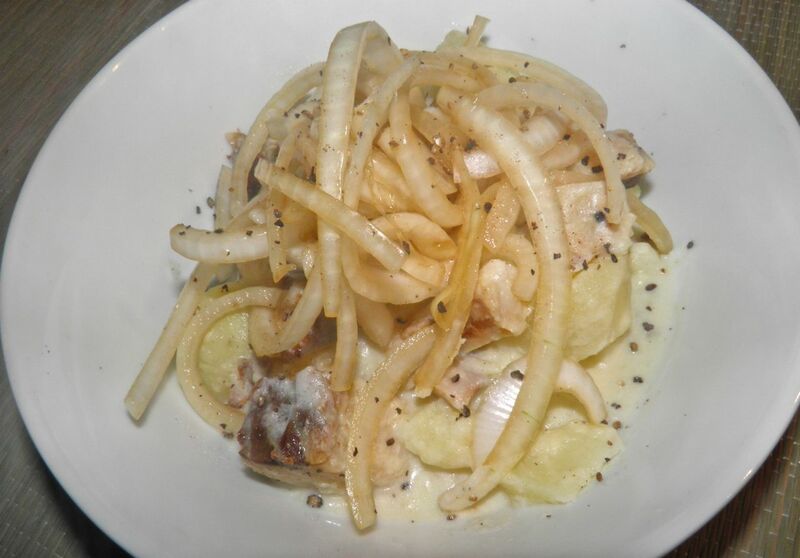 Serve the creamed potatoes and fish in a bowl with the onions on top.